Hello. Let me introduce myself. I am Susan Bernard and the author of the “I’m Not Afraid... Anymore!” series. In 1981, I graduated from the University of Oklahoma with a teaching certificate in Business subjects and English writing. I began my first teaching job that same year. As my family grew, I decided to teach my children and several other kids at home. In the 12 years that I homeschooled, one of my favorite subjects was math. By 2001, I decided to return to public teaching. I spent six summer weeks studying full-time for my “big test” – the one that would certify me to teach math, the subject that I had come to love teaching. It was a challenge as most any worthwhile task is, but I succeeded and earned certification to teach high school math. Soon after that, I authored “I’m Not Afraid of Math Anymore!” A Guide to the GED® Math Test. In 2009, I furthered my education with graduate work in Adult Education at the University of Oklahoma, and continued with one writing project after another for adult students. Now several math books are available for GED® and HSE Math Tests as well as English materials for those learning English as a second language. It has been my joy and privilege to lead students out of the land of fear and into the land of GED®-HSE graduates and English writers. It is my hope that the “I’m Not Afraid... Anymore!” series will help you to learn all the new things that you need for success in your education and in life. Why I Wrote "I'm Not Afraid of Math Anymore!" Many GED® preparation books use “textbook” language! When I first began teaching a class of GED® students in 2002, they were often frustrated when they couldn’t understand their traditional GED® books. It was almost impossible for some of them to accomplish much by themselves because they would “get stuck”. One day, I needed to go to a teacher workshop, and I wrote out a math worksheet for the substitute to give the class while I was gone. When I came back to class, my student, Cristie, asked me to write more. I soon realized that I needed to write an entire math book in the language that Cristie and my other students could easily understand. “I’m Not Afraid of Math Anymore!” was begun. I didn’t have any fancy math book writing software, but I had a desire to make learning math better. Everything has continued to grow from there. Now students like Cristie get help everyday! As I teacher of writing and ESL, I always dreamed of writing the perfect textbook. It needed to apply the principles of adult learning theory; it had to be relevant to the learner, help them fulfill societal roles, and help them improve themselves. Second, it had to be concise, well organized, and help the learner step-by-step. Last, it needed to clearly help the learner understand how language, grammar, writing, and editing are individual tasks that any person can master. Then by chance, I picked up a GED® writing book Susan Bernard had written, and I realized that with some changes, it could be adapted to ESL learners. Many years of teaching experience have gone into this book. "I'm Not Afraid of English Anymore!" has all the tools needed to help ESL learners succeed in their writing of English. Interested in Hosting Professional Development? 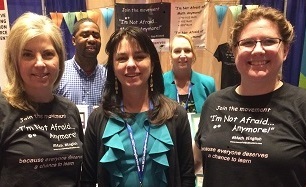 As a boots-on-the-ground high school equivalency coordinator for the Oklahoma City Community College and as a state and national presenter, I have had the opportunity to train many teachers in using the "I'm Not Afraid... Anymore!" curriculum and hands-on activities. Although the curriculum is user-friendly and can certainly be navigated alone, there are always benefits to exploring curriculum and activities together in groups. If you're interested in hosting a teacher workshop with interactive "I'm Not Afraid... Anymore!" training, please contact me at Susan@imnotafraidpublications.com or (405) 413-1586 for more information and to check availability.